Born in Niendorf, Holstein, Christian Rohlfs entered the Grossherzogliche Kunstschule in Weimar in 1870. After a pause due to health problems resulting from an accident in his childhood, in 1874 he returned to his studies with Ferdinand Schauss and Alexandre Struys. In Weimar, Rohlfs received a highly academic teaching which weighed for several years on his artistic development. In the 1870s he travelled in different occasions to Paris, where he came across the work of the Barbizon School painters, although his plein air landscapes from the beginning of the 1880s still maintain the large format typical of history painting. After finishing his studies in 1884, Rohlfs began to free his palette, giving up the use of black and increasingly using a more sketch-like technique. The decisive turn in his painting took place in 1900 when, through Henry van de Velde, he met Karl Ernst Osthaus. 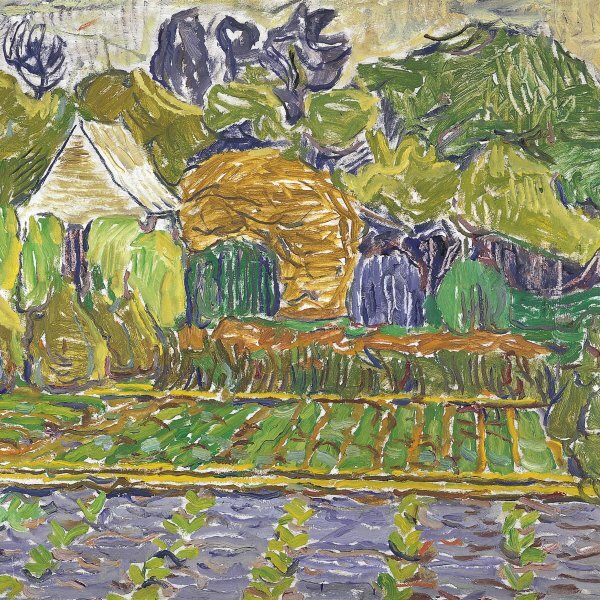 A patron and collector, Osthaus owned an important collection of works of modern and primitive art-including paintings by Monet, Signac, Cézanne, Gauguin and Van Gogh-which Rohlfs was able to contemplate. In 1901, when Osthaus opened his private museum-the Folkwang Museum-in Hagen, he invited Rohlfs and asked him to teach painting in an academy adjacent to the museum, a project which was never put into practice. As a result of his contact with modern art, Rohlfs painted his first pointillist works in those years. Towards 1905 he befriended Emil Nolde, who introduced him to the paintings of the Brücke artists. In the summer of 1906, they worked together in Soest, near Hagen, where Rohlfs painted his first expressionist works. In 1907 Rohlfs entered the Sonderbund westdeutscher Kunstfreunde und Künstler, works in presided by Osthaus, and in 1911 he joined the Neue Berliner Secession. During those years Rohlfs reached his artistic maturity, executing compositions with figures with thick angular outlines and bright translucent colours. World War I was, for Rohlfs, a period of pessimism and depression, as he was plagued by illness and deafness. Paintings with religious subjects, absent from his previous works, began to appear. After the end the war came a new period of vital affirmation and optimism, with depictions of flowers. In addition, the density of oil painting gave way to other techniques, such as tempera and watercolours. In 1929 the Christian Rohlfs Museum opened in Hagen. Like the rest of the German expressionists, Rohlfs was harassed by the Nazis during the 1930s. In 1937 his art was declared degenerate and he was forbidden to paint and exhibit, while 412 of his works were confiscated from German museums. Rohlfs died in Hagen on 8 January 1938.